HARPS measurents overplotted to the best fit two-planet model. 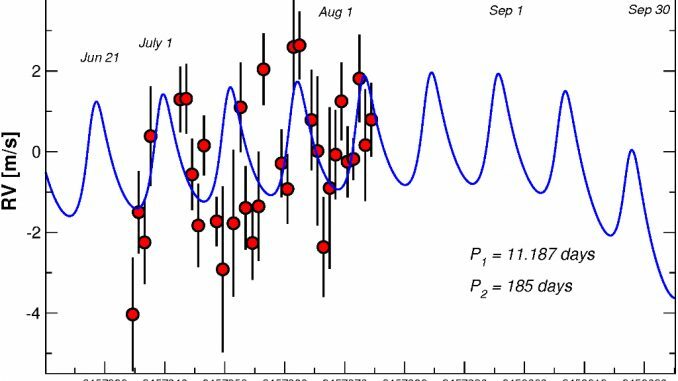 Weather has improved in the last few weeks compared to June, and we have now (August 10) we have reached 33 HARPS epochs of the ~50 possible ones for Proxima, Barnard’s and Ross 154. 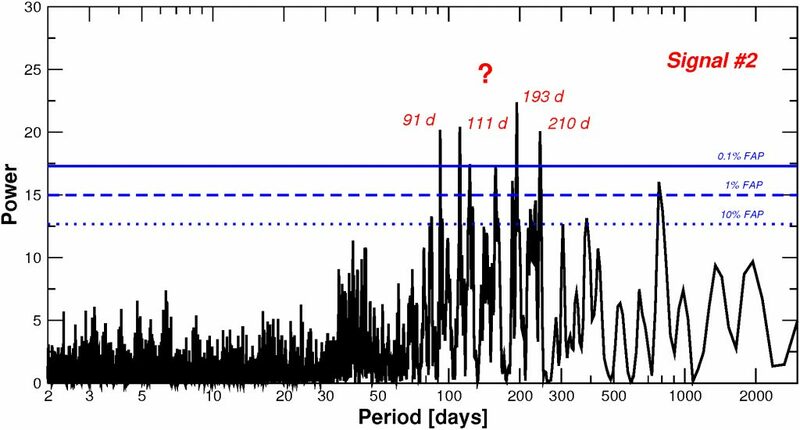 Data on Proxima remains tricky to interpret. 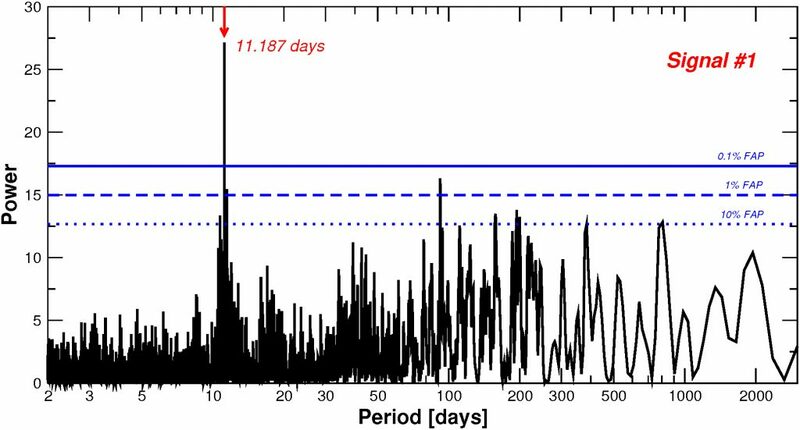 When all datasets are combined together, the signal of Proxima b remains strong and growing in significance, but the new data alone shows only weak evidence of it. This is within the expectation for such a small signal, and the not-so ideal sampling caused by the first weeks of bad weather. 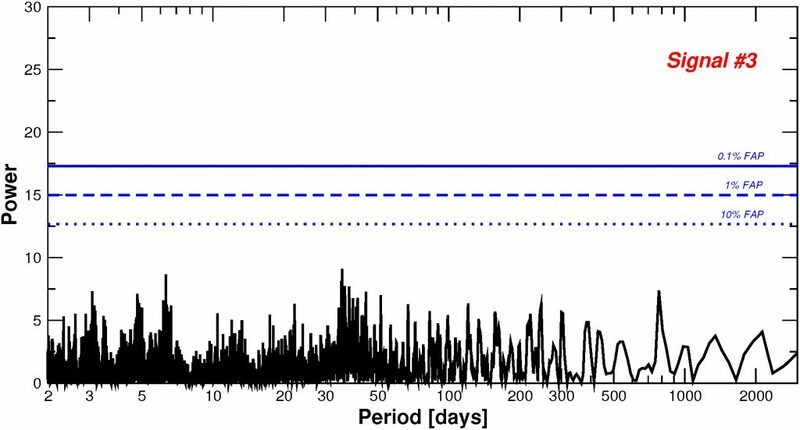 Detection periodogram of Proxima b. The signal remains strong and clear when combining the new data with all the existing datasets (UVES and HARPS). More mysterious is the nature of the longer term signal. Non-random variability remains beyond reasonable doubt, but four candidate periods are equally favoured. Once one of these second signals is added to the model, not much is left on the data. Detection periodogram for a second signal. Although the variability is significant (peaks over the 0.1% FAP threshold), one cannot pin-point a unique solution (all peaks have similar model probabilities). Hopefully one of the solution will become much more prominent than the others at the end of the campaign. If that doesn’t happen the ambiguity will remain and we won’t be able to tell whether it is caused by a planet or stellar activity. This multimodal structure typically occurs on poorly sampled signals and/or quasi-periodic spurious variability from stellar activity. This is, of course, our preliminary quicklook to the data. Once we have all the simultaneous photometry and other diagnostics ready, the picture might change especially concerning Signal #2. Signal search for a third planet around Proxima. At least at periods longer than 2 days, we see no clear evidence of anything else left. This does not mean there are no more planets, but they are likely beyond our detection capabilities. We are sure our colleagues will also have their own opinions. Please feel free to express them via comments here, or live discussion in the social media (@RedDotsSpace, and Facebook page). As before, measurements and spectra are available here.